Loria Consulting - What is CRM? Good customer relationship management is essential for any profitable, growing business. We all like to feel valued and that our requirements are important to the company, no matter how small. This leads us to use them again and again, becoming that rarest of things in the current market: a loyal customer. And as any serious business knows, it is far more efficient to sell again to a happy customer than continually having to find new clients. For companies with a few customers, building customer loyalty is easy. However, as the business grows and the number of customers and prospects increases, maintaining the personal touch becomes more difficult. A growing staff inevitably leads to people gathering information about clients, much of which is kept in their heads. This is OK all the time that a person is available to manage the relationship with their contacts. But life is not like that. Staff come and go, are ill and even take holidays. This valuable information is then gone, resulting in reduced customer service, potential lost business and, at its worst, a customer who follows their contact to their new job. Commercial systems like Sage CRM, have been developed to provide a functional toolkit to capture the information that typically walks out of the door at night. This not only ensures that the business has the information to manage current and prospective customers efficiently, but also reduces the risk of losing customers due to changes in personnel. In addition it gives the company a powerful base of data for marketing and on which to make more informed business decisions. create a searchable database of contacts such as customers, prospects, suppliers etc. with whom the company does business. link emails and documents to contact records and make notes of meetings, phone calls etc. so that all information is in one place. coordinate individual and team calendars, sync'd with Outlook. capture new sales leads and opportunities and track these through to completion. create and manage targeted email, telephone and direct mail campaigns. capture and track customer service issues to a defined service level with alerts and escalations. have structured workflows to control and manage business processes. run 'business intelligence' reports and create dashboard views for instant status. 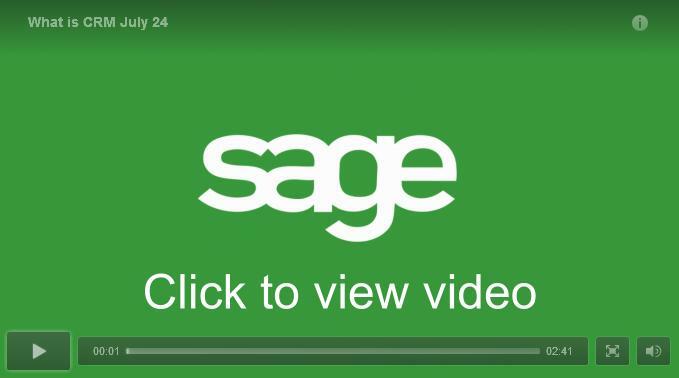 Find out more by clicking the following links or contact us to arrange for a demo of Sage CRM.